and the Hotlum-Wintun Ridge along the left skyline. This stunning view is found along Highway 97. 14162 ft (4317 m) Highest volcano in California . 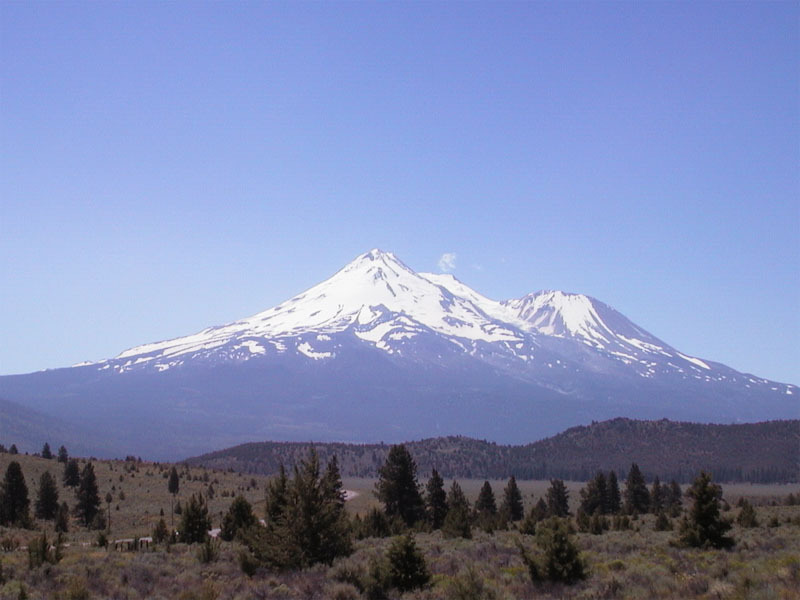 Mount Shasta is the second highest volcano in the Cascade Range and in the lower 48 United States. The permanently snow-capped cone dominates the skyline of southern Oregon and northern California for hundreds of miles in any direction. Shasta is in fact the most massive stratovolcano in the Cascade chain, rising almost 12000 ft (3600 m) from the surrounding lowlands and easily surpassing in volume the slightly higher Mount Rainier. However, Shasta's southerly location (and slight rain-shadowing from the Coast Range) results in somewhat lower snowfall and less glaciation than the more northerly peaks of the Cascade Range. 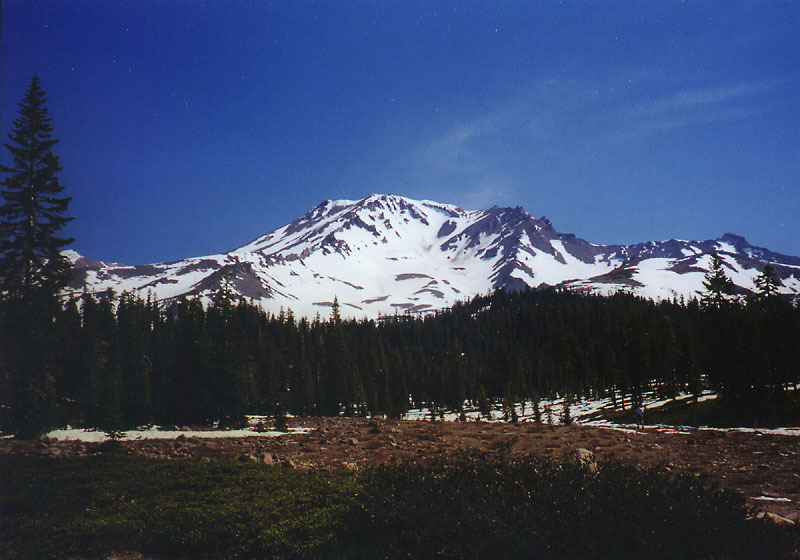 Nevertheless, Shasta supports eight glaciers including the largest in California, and the deep winter snowpack provides good skiing well into the summer. The relative lack of crevasse hazard on most summit routes coupled with generally good springtime weather makes Shasta into THE ideal peak for ski mountaineering. The paved and plowed Everitt Memorial Highway provides quick and easy year-round access from the City of Mount Shasta to the alpine areas on the south and west sides, permitting skiing from late fall through early summer. Avalanche Gulch on the south side is the classic (and much too popular) climbing and skiing route to the summit, offering a continuous crevasse-free ski run of over 7000 vertical feet. The Hotlum-Wintun Ridge on the northeast side is even better, since it is far less crowded but has similar vertical and drops in a magnificently steep, direct line off the true summit. This may be the finest ski descent in the entire Cascade Range, and even in the United States. (24 km) This route traverses north from the Sierra Club Cabin, leaving the crowds behind as it heads into the huge bowl of Hidden Valley, between Casaval Ridge and the southeast flank of Shastina. It then climbs to the 11900 ft saddle east of Shastina, from where it is possible to go west to Shastina's summit or climb east to the summit of Shasta via the upper portion of Whitney Glacier. A steeper variation heads directly up the West Face Gully from Hidden Valley, topping out at 13400 ft at the top of Casaval Ridge, and then following the standard route to the summit. During winter or early spring, it is possible to descend the lower portion of Cascade Gulch (below Hidden Valley) all the way down to the Everitt Highway at 5000 ft, with a car shuttle back to Bunny Flat. (26 km) The Whitney Glacier is the largest glacier in California, extending over 2 miles (3 km) in length down the northwest trending gap between Shasta and Shastina. The route follows the Whitney Creek drainage directly onto the terminus of the glacier, and follows its entire length to about 13800 ft, just below the summit plateau. The uppermost portion which heads east to the plateau is quite steep, but this may be avoided by continuing southeast and joining the standard route at the base of Misery Hill. The Whitney Glacier is heavily crevassed, with a major icefall above 11000 ft, so it is best skied in early season when the crevasses are covered by a deep snowpack. A variation which avoids the crevasse hazard follows the Whitney-Bolam Ridge, just northeast of the glacier, above 10000 feet. It is also possible to traverse to the ridge to avoid the icefall and then rejoin the glacier above. (26 km) The relatively-uncrevassed Bolam Glacier is the best of Shasta's eight glaciers for skiing. Access from North Gate is short and straightforward, but in early season when that road is snow-covered it may be easier to take the longer approach from Bolam Creek. Several variations are possible on the upper portion, including the very steep Bolam Gully which leads to the upper portion of Hotlum-Bolam Ridge. For a continuous ski descent from the summit, it is best to follow gentler gullies which lead from the upper Bolam Glacier southeast to the summit plateau. The Hotlum-Bolam Ridge itself is the standard north side climbing route, but the uppermost portion becomes windblown and loses its snow cover before summer. Numerous snowfields adjacent to the ridge below 13000 ft remain skiable well into summer, although on the east these merge into the heavily crevassed Hotlum Glacier. (18 km) The Brewer Creek trail provides quick access in late spring and summer to several routes on the northeast and east sides of Shasta. The Hotlum Glacier is the most voluminous in California and makes a fine climbing route, but is diminished in quality as a ski route due to its numerous crevasses and icefalls, along with generally unskiable cliffs at its head. Numerous snowfields nearby offer fine skiing well into summer, including the ones which line the north side of the Hotlum-Wintun Ridge. This is an exceptional ski route, a very natural and direct line with just the right pitch, steep but not too steep. At 12400 ft, the ski route crosses the ridge onto the north edge of the Wintun Glacier, which is relatively crevasse-free. This route is skiable continuously from the true summit down to 8000 ft well into July, even in mediocre snow years. 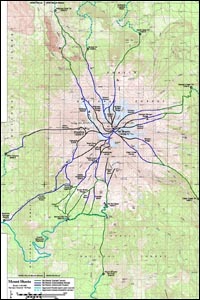 (Detailed route info and trip report from July 2000 coming soon. This was an superb trip, 6200 vertical feet on great snow.) The northern lobe of the Wintun Glacier itself may be descended directly to snowfields south of Hotlum-Wintun Ridge, although this requires a longer traverse to return to the trail. 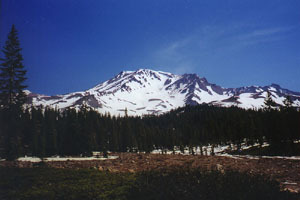 (20 km) The Clear Creek Route (Southeast Ridge) and the neighboring Wintun Ridge are the least difficult climbing and skiing routes to the summit of Mount Shasta. Access is somewhat long, however, until the road to the trailhead melts out in late spring. Unfortunately, the routes are best skied in early spring, since their southeasterly aspect and somewhat exposed position leads to an early loss of snow cover compared to the north side routes or Avalanche Gulch. When the snowpack is deep enough, these routes offer a variety of broad open slopes and bowls with somewhat less avalanche hazard than the steeper routes above. (11 km) The lower portions of Avalanche Gulch below Lake Helen (10400 ft) provide moderate ski terrain in a variety of open bowls above Horse Camp. This area has much less avalanche hazard than the steeper slopes above, although massive avalanches from high up in the appropriately named Gulch can still reach this lower elevation terrain during severe avalanche conditions. one-way This is the easiest way to do car-shuttle skiing on Shasta. Follow the normal route to Horse Camp, then traverse north a bit and descend west into the lower part of Cascade Gulch and follow it the way down to the Everitt Highway at 5000 ft, where a car can be left ahead of time or one could hope to hitch-hike back to Bunny Flat. Since so little effort is expended to reach Horse camp, this route could easily be repeated several times in one day. 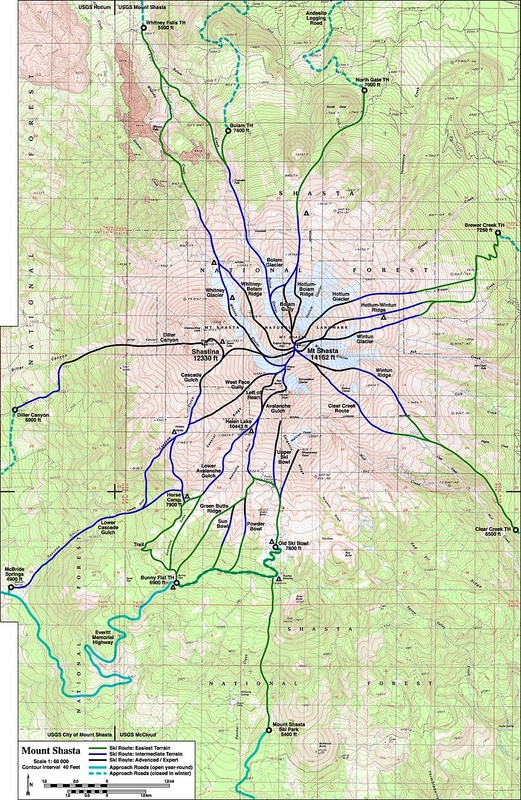 (14+ km) A variety of ski terrain can be accessed from winter into late spring via the unplowed portion of the Everitt Highway, which leads from Bunny Flat to the site of the former Mount Shasta Ski Bowl. This ski area closed in 1978 following an avalanche which destroyed most of the lifts. The East and West Bowls of the former ski area provide a variety of moderate terrain which steepens considerably as one heads north towards Shastarama point. The new Mount Shasta Ski Park is located 2.5 miles (4 km) to the south, and is an easy downhill ski run from the Ski Bowl. The Sun and Powder Bowls lie just west of the Ski Bowl and Green Butte, and are accessible easily from the road a mile past Bunny Flat. 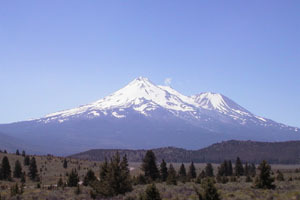 (17 km) This is the standard route to climb Shastina, the prominent satellite cone on the west flank of Mount Shasta. Follow the description above to the Shastina saddle, then head west less than a half-mile to the summit of Shastina, which consists of several small overlapping cinder cones with prominent craters. Lakes can be found in three of these depressions, but these are always snow-covered until mid-summer. (11 km) Diller Canyon is the massive gorge on the west flank of Shastina, the path of numerous pyroclastic flows which inundated the townsite of Weed over 9000 years ago. Snow drifts accumulate in the shelter of the lee (south) side of the canyon, providing a steep and direct ski line from the summit of Shastina into late spring. A maze of old logging roads provide access to above the 5000 ft level, just south of the canyon.